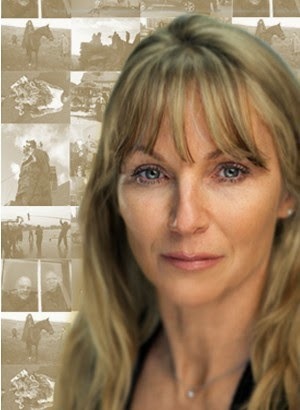 Leading stunt professional Abbi Collins has joined the Poldark crew as stunt co-ordinator. Abbi has worked on many award-winning films and television shows such as The Selfish Giant, Misfits, and Doctor Who as a stunt co-ordinator, fight arranger and horse master. Recently she worked on BBC2's The Wrong Mans. On her website Abbi says, "Whilst specialised action usually requires stunt performers, one of the most rewarding aspects of my job as a Stunt Co-ordinator is working with actors of all ages to facilitate their involvement in action sequences." 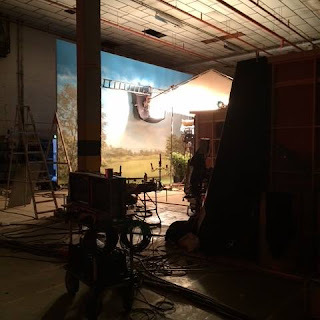 She adds, "Actors and horses, plus a film crew are a recipe for disaster unless a good, safe horse is supplied, along with a knowledgeable teacher and horse master. It is a situation which must be taken very seriously by production and the correct professionals engaged." 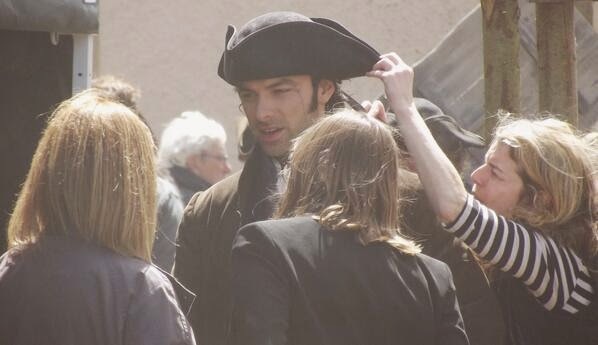 To bring Abbi's point home we only have to turn to the incident that occurred during the Poldark filming in Corsham recently when an ox was spooked as Aidan Turner (Ross Poldark) rode by. Bystander @Dorina335 told Mammoth Screen on Twitter that the horse was startled but the ox was quickly calmed down and Aidan rode away. This incident shows us just how quickly things have the potential to go wrong without the right training for horse and rider. Mark Atkinson who is supplying the ridden horses for Poldark told me that this is the fifth job they have done with Abbi and that she is the "ultimate professional" who listens to the actors and horse master and works together with them. We'll have more from Mark and the horses on Poldark in the coming days. 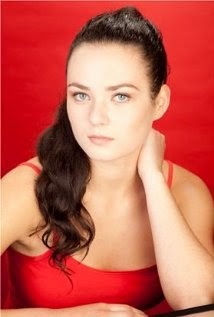 Meanwhile you can have a look at some of Abbi's work in her showreel here. Mammoth Screen is co-hosting a surprise birthday party for Aidan Turner and his fans. These wonderful people are going to do a cake & ice cream party for Aidan’s 31st b-day and present birthday cards and presents from the fans at this celebration. Mammoth Screen is also going to take photos of Aidan opening his presents and of course blowing out his candles. This is so awesome as not only will the fans know Aidan has received their b-day cards & gifts, they’ll get to see photos of him opening them. This is actually beyond awesome! 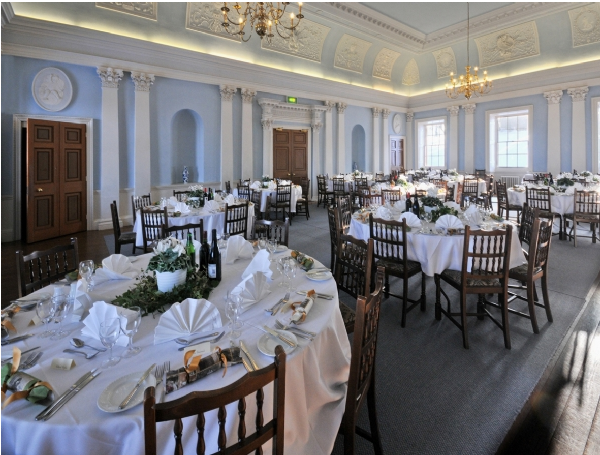 Mammoth Screen is one of the top independent television production companies in the UK and Ireland. 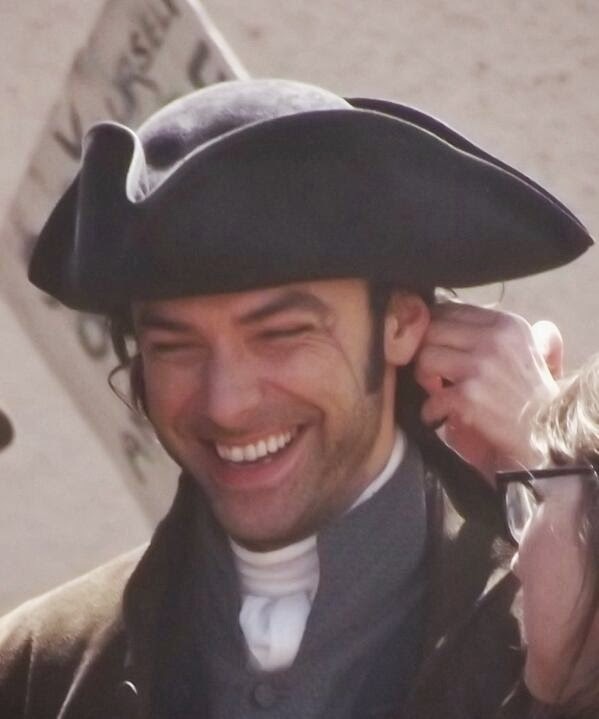 They are also the smartest group of people in the world because Aidan Turner was their one and only choice to play the dynamic Ross in their reboot of the iconic Poldark series. 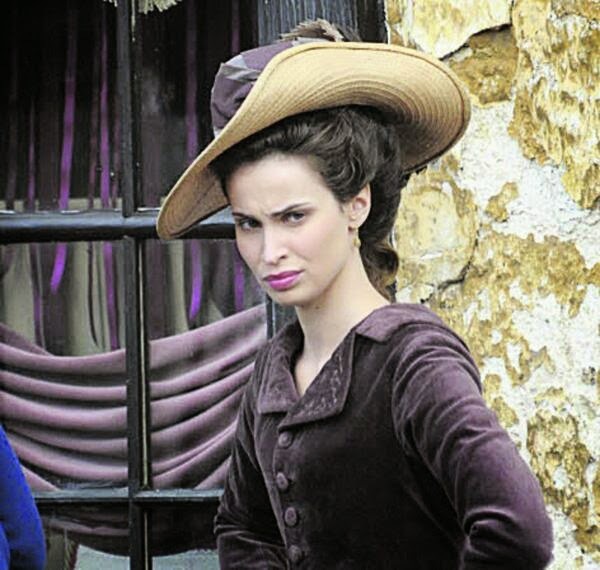 Mammoth Screen’s other productions include Endeavour, Blandings, Monroe and Parade’s End. It’s all brilliant! When Mammoth Screen was approached to put on this party, one of the first thing they said, was they were fans of Aidan too. Like his many fans, they know Aidan to be a very sweet person, and they are willing to go out of their way to make him and his fans happy. From day one they’ve approached this event with an “of course” & “we can do that” attitude. 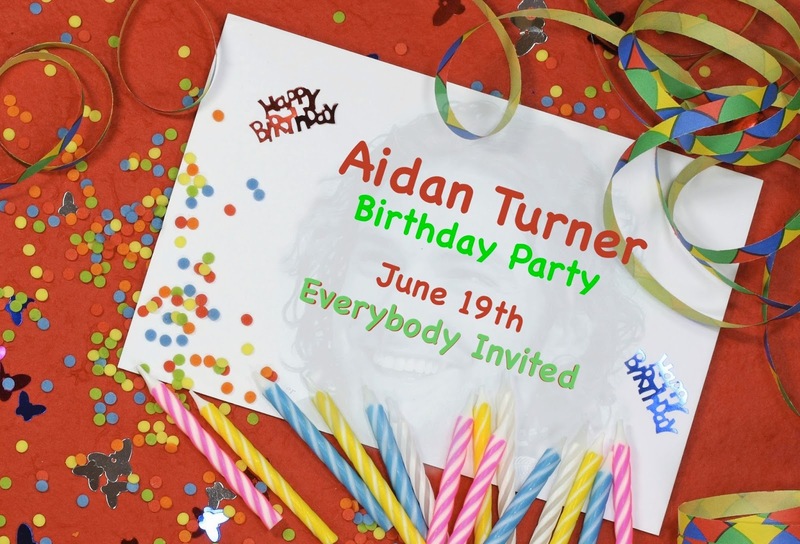 Not only are they going to do have this party for Aidan’s fans, they’ll put on their “marigolds” and do the cleanup afterwards. It can’t get any better than this! 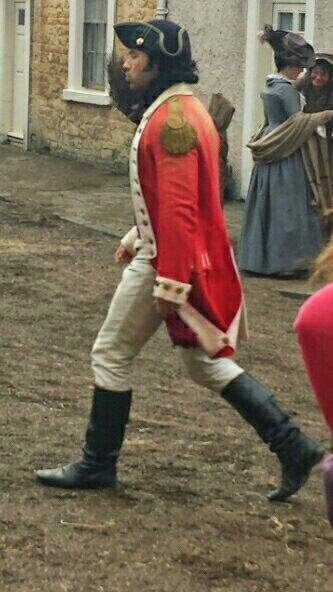 Any questions about Aidan’s surprise party should be directed to the Aidan Turner Forever fan site at: aidanturnerforever@gmail.com Please don’t email Mammoth Screen with inquiries as they’ll be busy baking the cake, but feel free to tweet them @MammothScreen with praise for their kindness, generosity and AWESOMENESS. Please also be considerate of Mammoth Screen and make sure your gifts are not too large or too heavy. So don’t do a bust of Aidan or box up and mail yourself. Lets say under 5lbs, as a guide – this is just a guide, not a requirement. The only requirement is to have fun! All cards & gifts MUST arrive at the UK address below by June 16th. 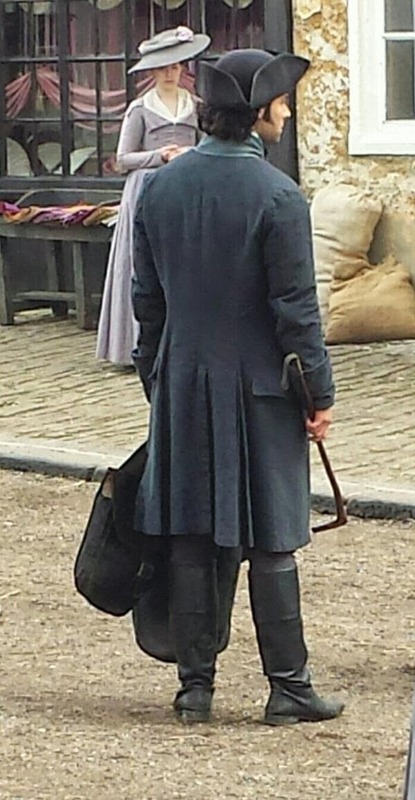 Here's the latest picture of Aidan Turner as Ross Poldark via the Official Poldark Facebook page. What a gorgeous photo. 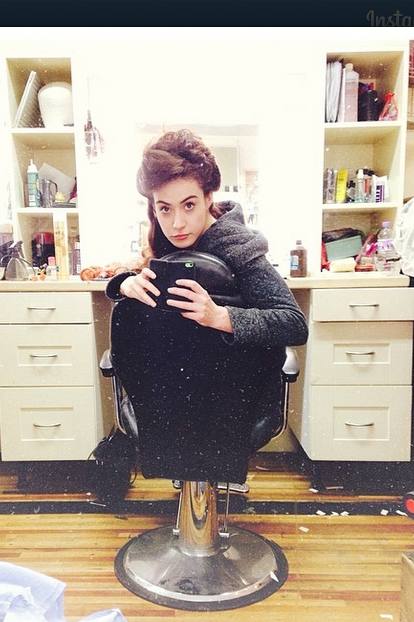 The lovely Crystal Leaity posted these pics of herself preparing to play Margaret Vosper in Poldark. Aren't they super - and fun too! 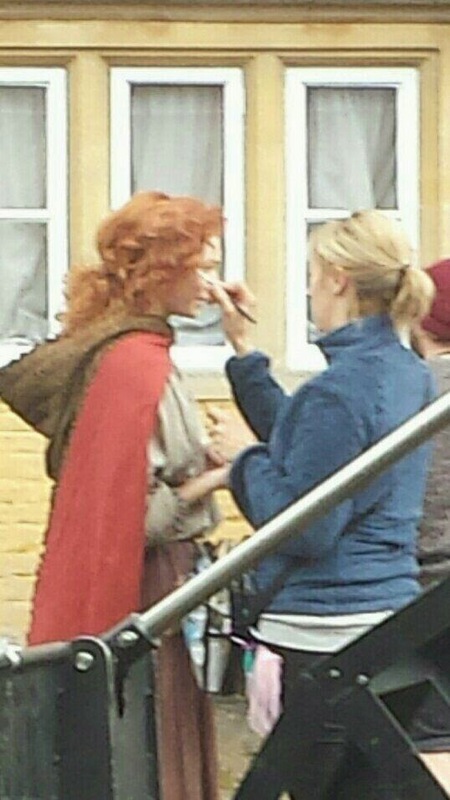 Eleanor Tomlinson is Demelza in the new BBC drama Poldark. Eleanor is the daughter of singer Judith Hibbert and actor Malcolm Tomlinson. She was born in London but was brought up in Beverley, Yorkshire. As a child she dreamed of becoming a vet but one day, after watching her father on the set of The Bill she says, "I looked around and saw my dad having a great time and how much fun he could have experimenting with his character and everything that went into it. I just fell in love with it." 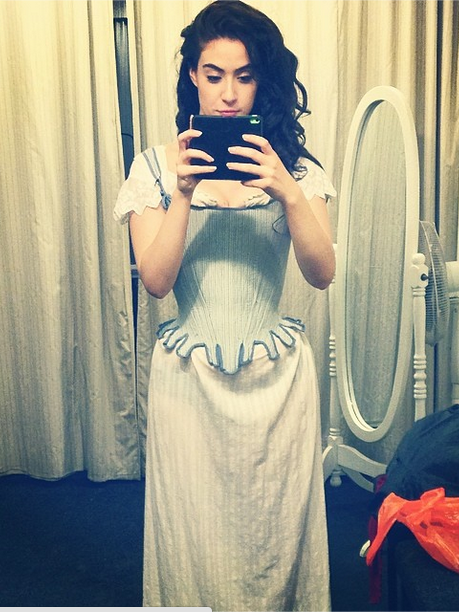 Eleanor played Isabelle in Jack and the Giant Slayer and Isabel Neville in The White Queen. 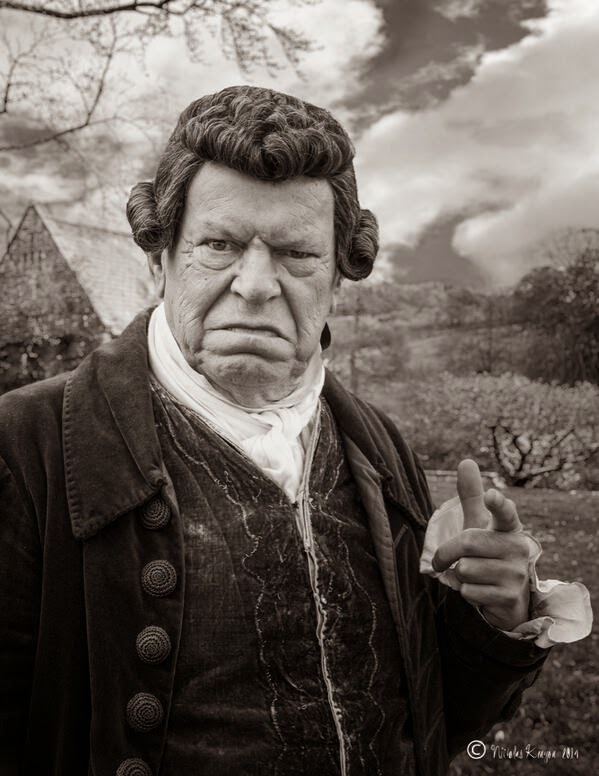 Julian plays the landlord of the Red Lion in Poldark..
Julian may have come to acting later in life than most, with a part as a Russian Zombie Killer in World War Z, but he must be one of our busiest actors with small parts in over 50 productions since 2011. Honestly, it's almost hard to think of a production he hasn't been in! He's appeared on TV in Atlantis, Being Human, Doc Martin, Dr Who, Broadchurch, Merlin and many more. He's been in films like World's End, Rush, Skyfall, Thor2, The Muppets Most Wanted and Les Miserables - not to mention films not yet released like Guardians of the Galaxy, In the Heart of the Sea and Turner. 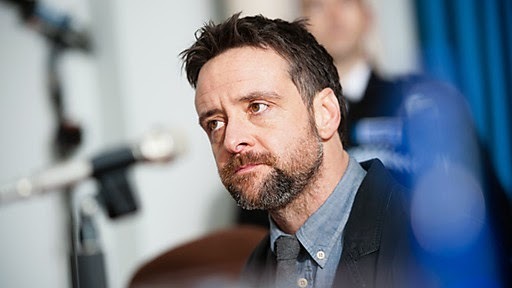 He plays a leading role in She's Dead which won Best British Film in the Dark Zone Movie Days Festival 2013 in Germany. Here's wishing Julian a Happy Birthday from Poldarked! 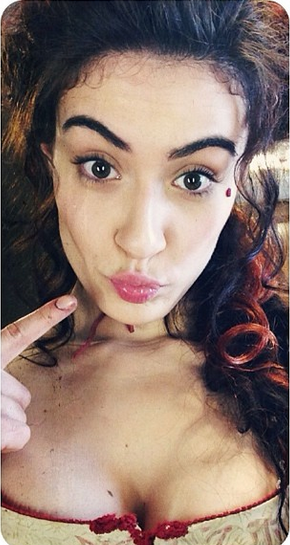 Poldark is to air in the US in 2015. It will be shown on Masterpiece on the Public Broadcasting Service (PBS). The original series of Poldark with Robin Ellis was shown on Masterpiece in the 1970s and was a big hit. The new series stars Aidan Turner (The Hobbit) as Ross Poldark and Eleanor Tomlinson (The White Queen) as Demelza and is adapted from the books by Winston Graham. 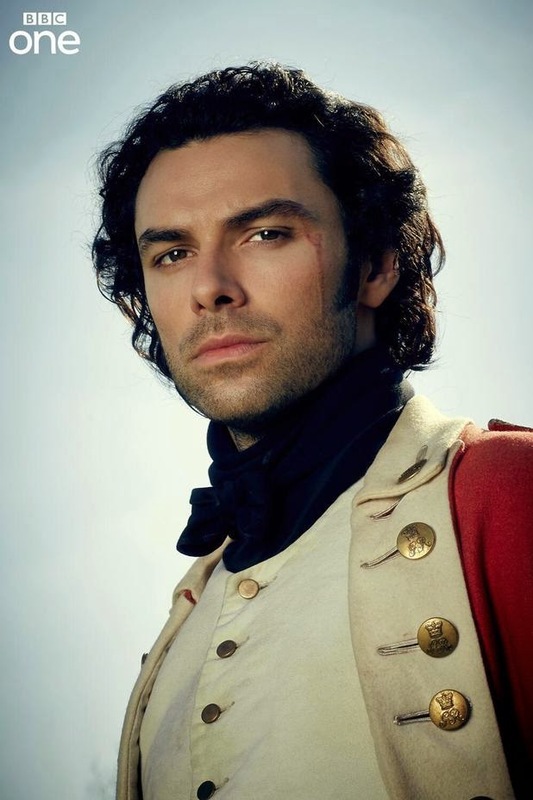 Masterpiece's Executive Producer Rebecca Eaton announced the return of Poldark at the PBS Annual Meeting on 14 May, 2014. She said, "I'm very proud to say that after 44 years, MASTERPIECE (sic) continues to make news, win awards, and attract new audiences, How many other television series have the great good fortune to make that claim?" 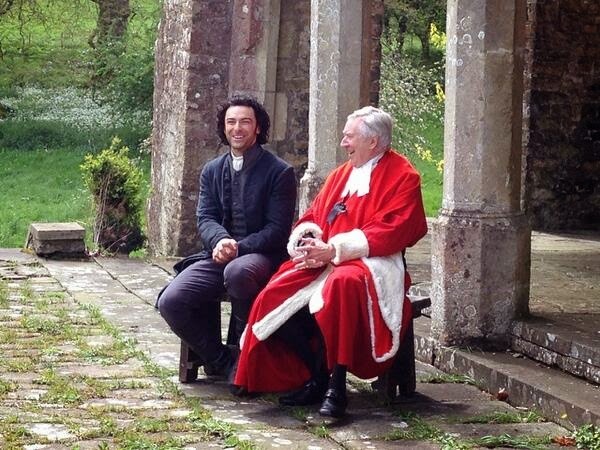 Mammoth Screen have just released this darling picture of the original and the new Ross Poldark together. Aidan Turner plays Ross in the new BBC drama but the original Ross, Robin Ellis, has also been cast, this time as Reverend Halse. Here they are taking a break from filming in Gloucestershire. As a tease, here is where they are sitting. Lovely isn't it? 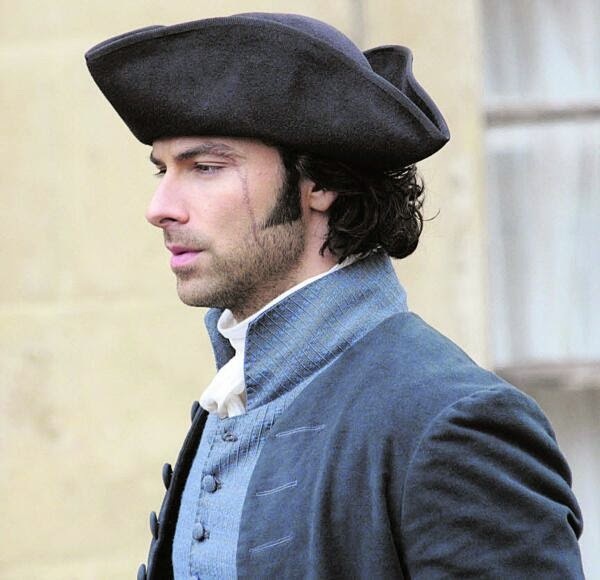 Poldark fans all over the world can breathe a sigh of relief at some news of international distribution for the drama. 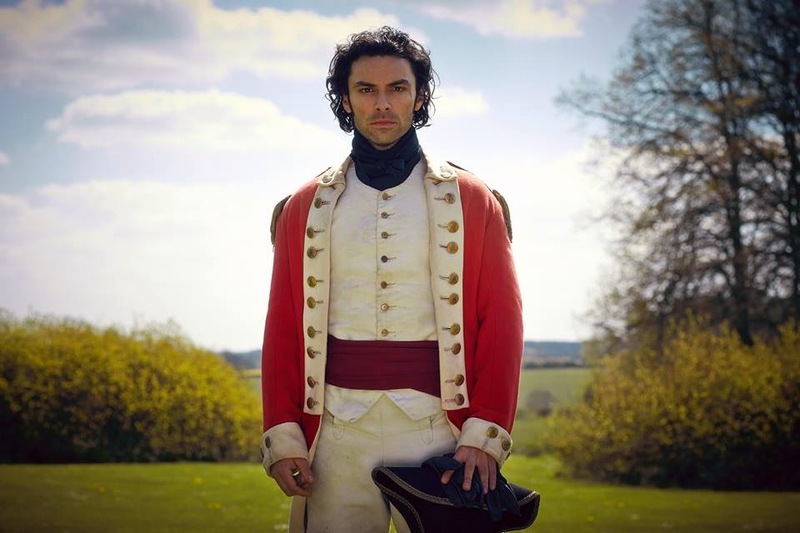 It's good to see Ross Poldark (Aidan Turner) in the uniform of an 18th century captain in this, the first picture of him released by the BBC for their remake of the 1970's drama Poldark. The Winston Graham novel opens with Ross in a carriage returning to Cornwall from the American War of Independence but last night Robin Ellis, who played Ross in the original series, tweeted that the carriage scene will not be in the latest adaptation. Robin plays the Reverend Halse in the new drama. 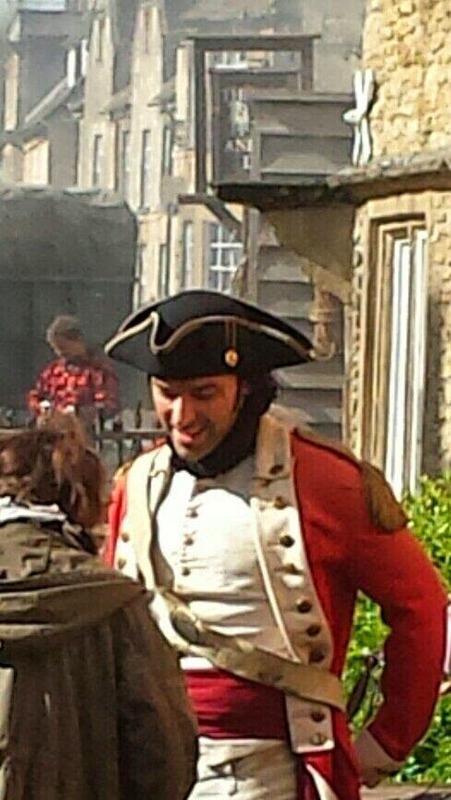 With that in mind, it's great to see from this picture and others from the filming in Corsham last week that we will still have a chance to admire Ross in uniform. 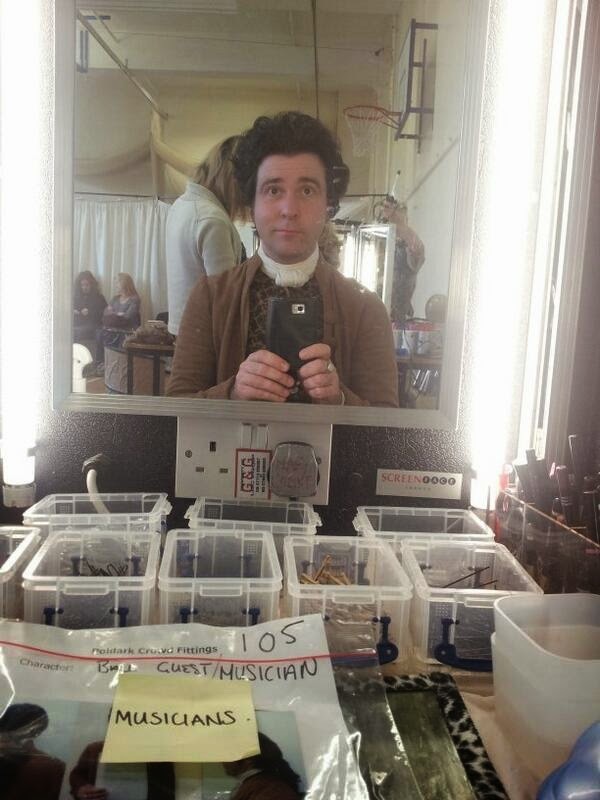 Poldark will air on the BBC in 2015. Two months will be spent filming Poldark in Cornwall this year but despite this, many comments have been made on social networking sites about the use of Wiltshire rather than Cornish locations for Trenwith House (Chavenage House), Sawle Church (Chavenage Chapel) and Truro (Corsham). Malcolm Bell, chief executive of Visit Cornwall however,says the filming in other locations will not affect the long-term impact Poldark will have on Cornwall's tourism industry. Mr Bell told the Western Morning News, “As far as the immediate economic opportunity is concerned with some of the production being filmed outside the county, it is a shame to miss out on that. But generally speaking the programme’s association will be 100 per cent with Cornwall, so that will be the viewer perspective - even if some of it is filmed elsewhere. “We will benefit from a boost, definitely. 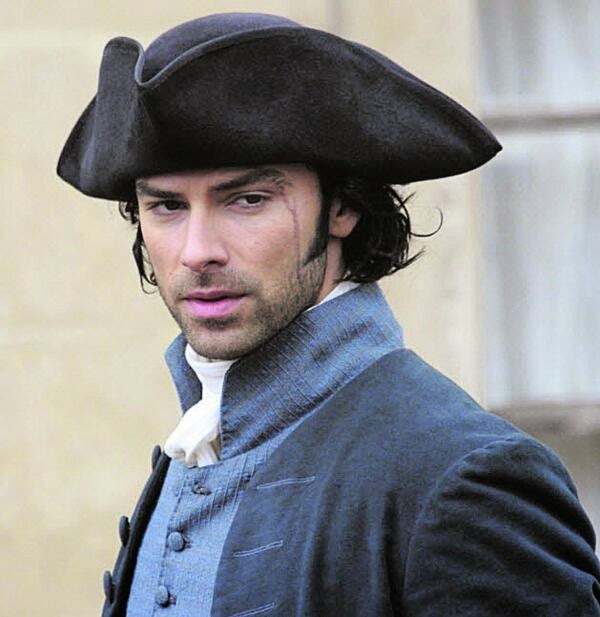 The beauty of something like Poldark is twofold: one is the immediate effect the programme will have - the other thing is that hopefully there will be another series off the back of it.” He added that it was continuity that brought in the tourists, saying of Rosamunde Pilcher and Doc Martin, "People watch the first series, then watch the second one - and then they really get into the place. It builds up over two or three years. 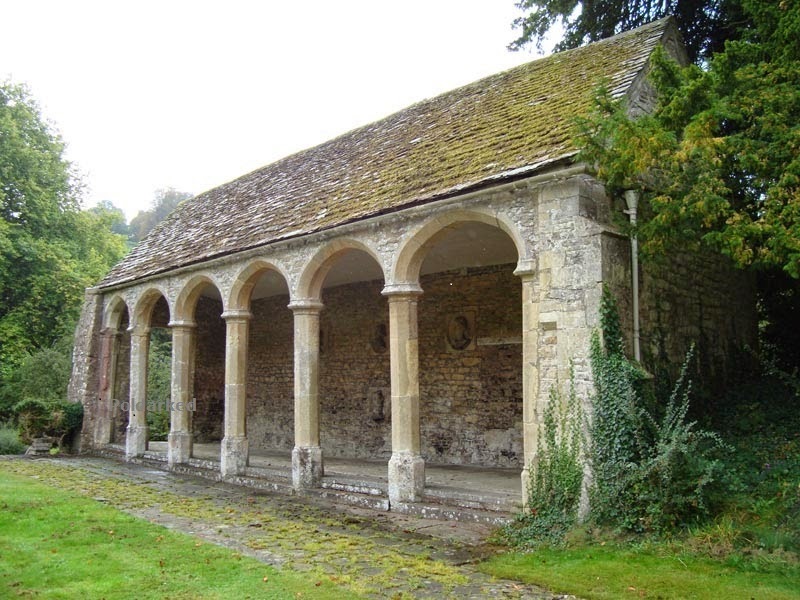 Addendum: It seems that it was the interior of Chavenage Chapel that was used as Sawle Church for filming, rather than the exterior. 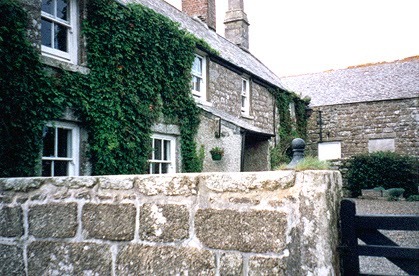 Poldark's publicist Lisa Vanoli has confirmed that the Cornish landscape will play an important part in the new BBC drama and that Ross Poldark's house, Nampara, will be in Cornwall. 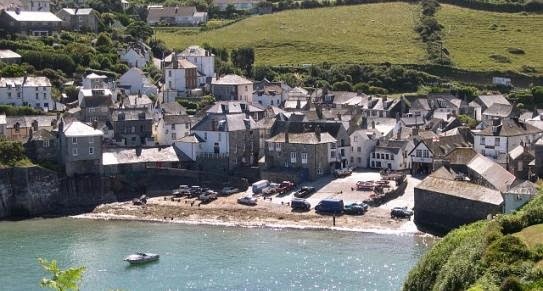 In an interview with the West Morning News Lisa says, “We are filming a huge amount in Cornwall - substantially more than in the original TV series. “All our key landscapes will be in Cornwall - including Ross Poldark’s house - but occasionally you have to go outside an area. Unfortunately. in Truro it just wasn’t possible, which is why we’ve had to film some street scenes in Corsham. She added, “But as far as I’m concerned it is very much about transparency - the fact is that we will be filming all our key landscapes in the county. I'm so glad to hear that Nampara is in Cornwall and can't wait to see it! 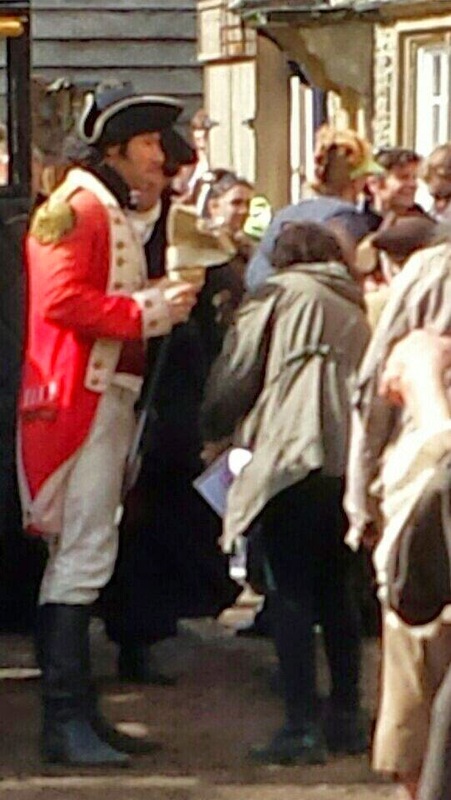 Aidan Turner made his first appearance on the Poldark set in Corsham today dressed as an 18th century soldier. 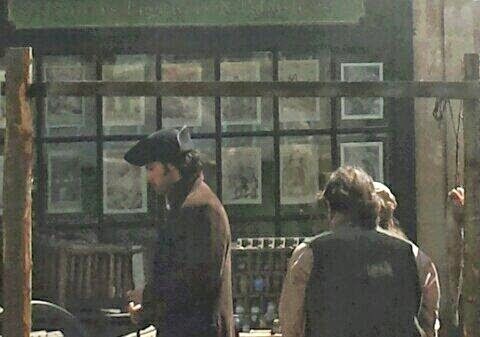 These two pictures were taken by Dorina who is in Corsham to watch the filming these next few days. You can follow Dorina on Twitter @Dorina335 . 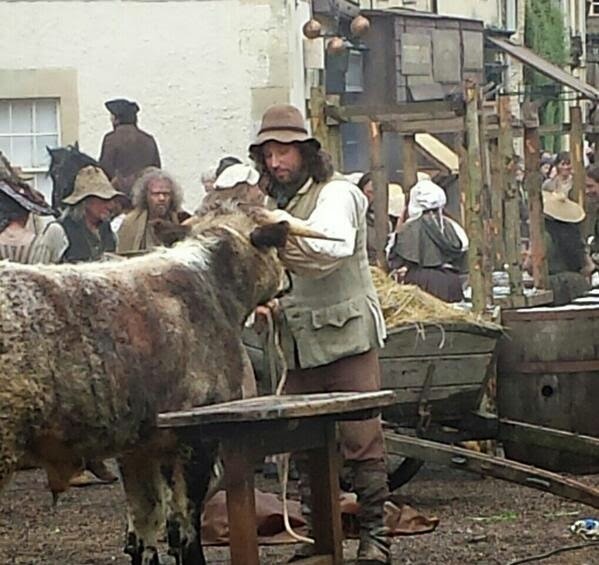 Update: Corsham Council have told me there will be no more Poldark filming there this year. 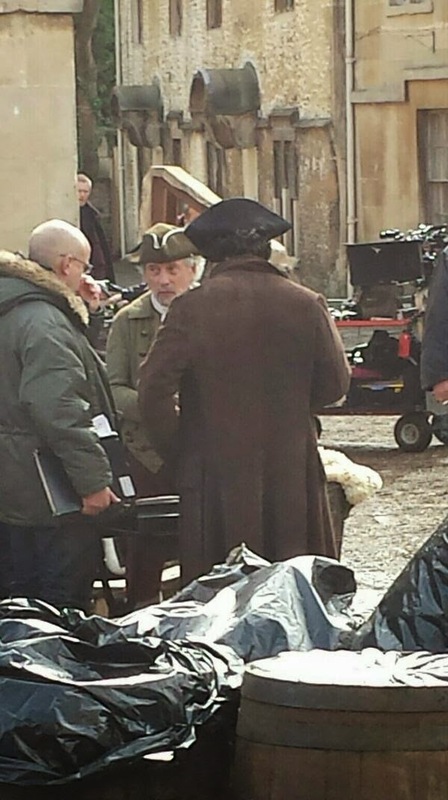 Could there be more filming of Poldark in Corsham later this year? 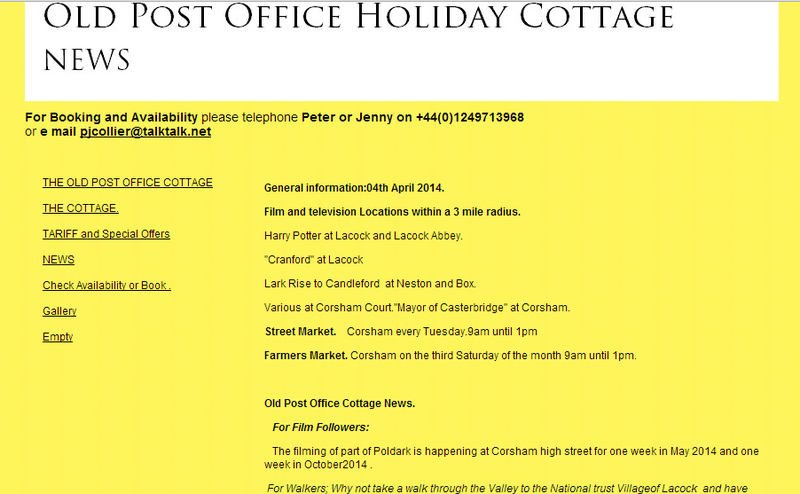 This holiday cottage certainly thinks so. They're advertising that there will be further filming in October. Many thanks to Aidan Turner Forever for sending me this. Robert is no stranger to taking on the role of doctor having played Dr Gordon Ormerod in the television series The Royal from 2003 to 2011. It seems he makes an excellent doctor as IMDB quote him as saying, "The lady behind the cheese counter at my local supermarket thinks I'm the real thing and continually asks me for advice about her ailments, primarily her battle with her varicose veins. Not what you want to talk about when you're ordering a quarter pound of Stilton!" 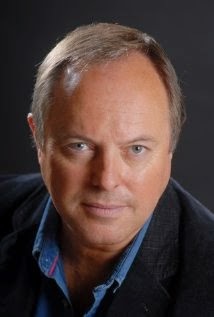 Robert's other credits include Casualty, Roger Roger and Outside Edge for which he was nominated Best Actor in the British Comedy Awards. Later this year he can be seen playing Professor John Chessman in the horror film The Unfolding. One of Robert's favourite appearances was on the last episode of A Bit of Fry and Laurie where he played the Last Post on his own trumpet. Robert was brought up in Leigh-on-Sea, Essex and trained at the Royal Academy of Dramatic Art. 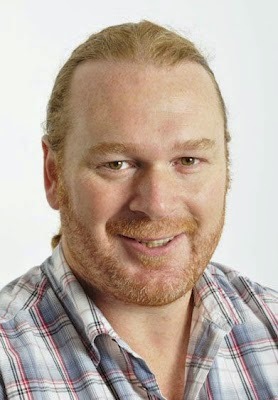 He can often be heard on the radio, his most recent recording being Incredible Women by Rebecca Front and Jeremy Front. He has also written a crime novella The Rock. Come September Robert will be Touring the UK in The Perfect Murder. See it if you can!